I, along with others, have been following internet and media coverage of the recent USCCB Fall meeting which I attended. It has varied from simple reporting to critical commentary. Some commentary in particular has seen the past meeting as a kind of litmus test for how the bishops of the United States “view” Pope Francis with we bishops receiving a less than stellar grade. As one who participated in the past meeting and engaged in many conversations with those who attended the meeting – bishops, USCCB staff, guests, observers, etc., I offer a few thoughts that may help clarify why things happened the way they did at the meeting. To offer appropriate assistance to each bishop in his local church. The amount of work, time, and effort that goes into establishing the “priorities” is huge. Every bishop has an opinion, every bishop has a vote, and every Ordinary has to weigh these “priorities” in light of the particular pastoral situation he is dealing with in his Archdiocese or Diocese. It takes a lot of wrangling and consensus building for the bishops of the United States to come to a place where they can agree to four “priorities” out of all the issues and challenges we face. Now, could we choose to “reboot” the priorities in light of the election, teaching, and direction of Pope Francis? Of course. But to do so quickly and smoothly would not be easy. Since the process of establishing the “priorities” is one that takes over a year and a half of meetings and review to come to a successful conclusion, it would take at least a year to do so again in midstream. And that could only happen if we could get a majority of the bishops to agree to do so. Furthermore, the work of each department and staff of the Conference is set and directed by the priority plan. When I meet as a member of various USCCB Committees and sub-Committees, the Conference staff reports to us about their work in reference to the “priorities.” A lot of time, talent, and resources are in play. That has to be taken into account as well. Now, again, this doesn’t mean a “reboot” can’t be done. It would just take a major action by the bishops and a willingness to accept a major cost in terms of resources to do so. Frankly, I don’t see it happening as the process itself allows for a reset of the priorities every four years anyway (see below). So our priorities and our general mission is set. In light of this, what went on at the last meeting was not a refutation of anything Pope Francis has asked the bishops to consider, nor an act of confusion among the bishops as to where the Pope is asking us to “move” as a Church. It was, basically, a continuation of the work of the Conference that was set into motion almost three years ago. The priorities that were established back in 2012-13 are still “driving the bus” and will, most probably do so, until the Fall of 2016. In addition, the priorities that we set back then are still for the Conference priorities now. Are we easy targets of the charge that we are fighting the political “culture wars” when the Conference defends traditional marriage, beginning of life and end of life issues, and religious liberty? Yup. Is it easy for those who seem to know what “Francis really means or is saying” to say that the bishops are running counter to what the Pope’s wishes may be? Yes indeed especially if one can claim to know what the Pope “knows.” But this begs the question: Is the Conference presently undertaking as a priority anything counter to the content of what Pope Francis is saying regarding matters of faith and morals? Absolutely not. And nothing changes the fact that the present “priorities” of the Conference are still of vital importance to the life and mission of the Church in the United States at the present time. 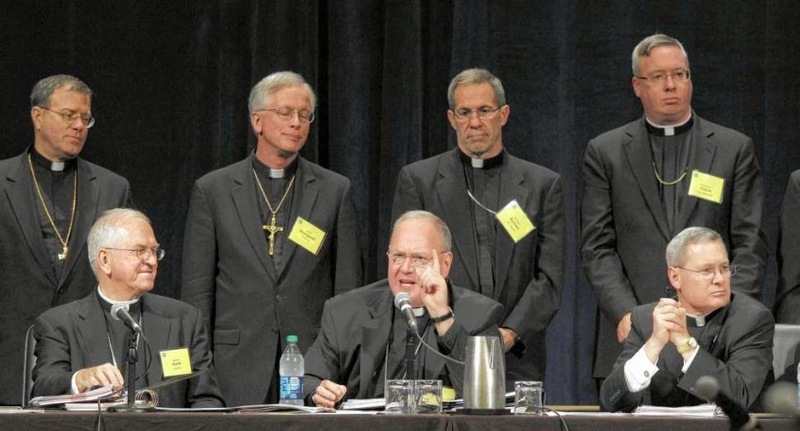 The bishops of the USCCB have begun the process of setting the priorities for the next four-year cycle which begins in 2016. At this week’s general session, we bishops broke into regional meetings for the first discussion of what those priorities might be. In my group, Region VII (IN, IL, WI), the discussion was wide-ranging and very “Francis-centered” – evangelization, care for the poor, immigration reform, our mission to youth and young adults, greater outreach and care for our Latino brothers and sisters, care for the marginalized, for the hurting and lost, as well as our on-going work on behalf of families and human life. There were a lot of references to “Evangelii gaudium,” to Pope Francis’ speeches and homilies, and to the new direction the Holy Father was taking us. It was a very healthy, honest, and open discussion. Is there a lot of work and discernment ahead within the Conference? Absolutely. The Conference is by its very nature a large institution that is often hard to steer in one direction let alone change course midstream. But the large and sometimes unwieldy group of pastors who make up the USCCB membership will find our way to continue to “foster Communion with the Church under the leadership of the Pope” under the wisdom and guidance of the Holy Spirit. I applaud the USCCB and your work within Bishop Coyne, the four stated priorities are exactly whats need to be focused on, here in the United States at this time. Religious Freedom, Faith, Family and Life..seems to me you can’t have anyone of those without the other. BRAVO! keep driving that bus! What I perceive in this critical commentary I have read is that the bishops do not get it. They do not understand the importance of these simple yet profound gestures of Pope Francis. He is inviting all of us to let ourselves be found again by Jesus. There is an apologetic, perhaps even boarding on defensive, speech on the part of many bishops. It seems that dodging personal contact with your priests, religious, and laity behind procedures, processes, and protocols, really is the antithesis of the example of Pope Francis and his vision for a missionary option for the church. Time to leave the house cassock in the closet, visit individually with your priests, meet the laity, and risk being out of our element, risk being vulnerable. Who knows, you might even see things a little differently? Hey Bishop. (Hope you are well)! My two cents: Your post is forthright and kind of boring. But I mean “boring” in a good way! It explains the process in a way that makes clear that not everything that happens is loaded with political intrigue. It also does it in a way that doesn’t sound like “spin.” I think sometimes ecclesial communications sound like they are created by a professional communications team that is trying to package a message. That often makes people lack trust. Your post, on the other hand, just sounds like the truth. Good job. God Bless. I have just finished reading John Allen’s excellent interview with Cardinal George, and I have continued to reflect on your article commenting on the recent meeting of the USCCB. I continue to gain insights as I read and reflect. I appreciate how the American bishops have structured their conference to be a structure in service to them and their mission and not a separate entity that could possibly be inimical to them is some ways. My observation is that the process takes several years to complete a cycle, and life in this technical age proceeds so much faster and in short spurts. Two observations I would offer. First, in pursuit of more transparency and candor, reduce and not augment the amount of your semi-annual meetings that are closed to the public. I know this will make it challenging in order to discern consensus, but I hope such a decision would alleviate so much inference on the part of the public. Second, I would hope that there is enough time for “new business” so that bishops could make interventions on matters affecting or being affected by the global Church. While it would not be possible for the national conference to comment as a body on current events, there could be more recognition — and, hopefully, more support — for the Pope and his agendas. The more I read about Ignatian spirituality, and learn the concepts and terminology, the more easily I think I am grasping what our Pope is about. You can’t have discernment without shedding light on all sides of an issue, and I am surprised that so many (including members of the hierarchy) consider this “confusing” or detrimental to the “unchanging” teachings of our faith.